Sunny, 50* and Clear, No wind [Yea].. Water Temperatures 49* up lake, 46* mid lake. All of my bunks on my trailer had rotted so Tony and I got some pressure treated wood and carpet, made the bunks and headed to the lake to drop the boat in the water while we replaced the bunks. The lake was dead calm as we worked on the trailer, unlike most of the previous week. It took us about 45 minutes to complete our project. We must have both been thinking the same thing, we threw our tools back in the truck, picked up some extra jackets out of the truck and jumped in the boat. It was 2:30 giving us time to catch bait and fish for a couple hours. It took us about an hour to catch bait leaving us enough time to try two spots. We set out our spread of boards and pulled about a mile stretch of humps and flats. 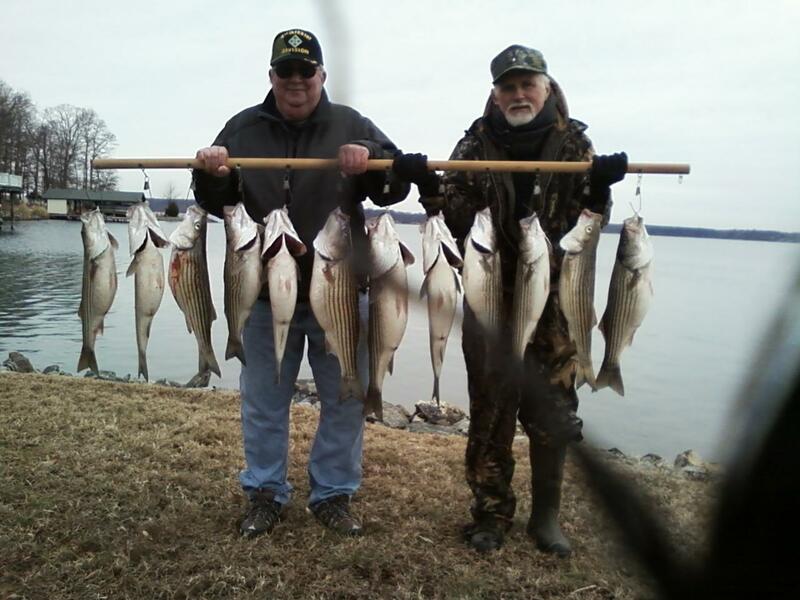 We took 8 or 10 hits but boated only 2 keeper Stripers. The sky was getting cloudy so we decided to make a move to pull boards over very shallow waters hoping the fish would take advantage of the low light conditions of the evening. I put the outer most boards right up on the bank and had been working a bank when I noticed a jon boat trolling nearby us get hung up in about 8 feet of water. As he backed up to retrieve his rig I told Tony this guy has to been an idiot trolling in such shallow water. After he got this bait back in the boat they ran their boat using the big motor 80 yards in front of us and proceeded to do doughnuts in front of us casting umbrella rigs around them as they ran their motor????? I am working a 500 yard bank, no other boats around, this guy has to pull directly in front of me in 6 to 8 foot of water next to the bank and spook any fish that might be there!!! I wanted to ask him did he intentionally want to ruin the last 30 minutes of my day by cutting in front of us spooking the fish or was he just a plain idiot but he didn't give me a chance. Just when I walked up to the front of my boat to yell at him [his motor still running] he took off, ran across the lake and cut off other fisherman working the other bank. Needless to say he did ruin the best time of the evening not only for us but the other fisherman also. We reluctantly emptied the baitwell and got our lines in. A beautiful nice calm evening was not completely upset by this discourteous boater, we had caught a dozen Stripers and had a nice stringer of fish. Sunny and COLD, Water temperature 45* and Clear. Here are a few recent pictures...The top picture is a net full of bait. My Lowrance was "lit up" from top to bottom when I threw the net. The net was so heavy I needed help just getting the net up. It is full of Gizzards and a few crappie. 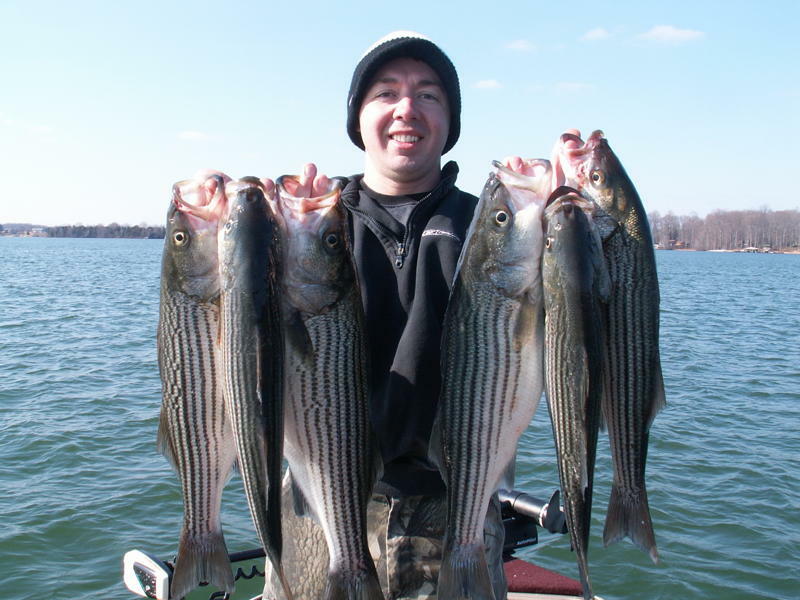 The next picture is of some nice Stripers we caught last week that I forgot to post. The picture on the Lowrance is of a pod of Stripers working a flat. They would not come up and hit boards so I turned around, put out 6 downlines and caught them. The bottom picture is Herring caught in my throw net. Click on the picture for a better view. Sunny and Pleasant, Water Temperature 46* and Clear. Brian and Eric wanted to get out this morning for a couple hours and catch a few Stripers for the game this evening. Eric is holding dinner for 10. Good Eating Tonight! Cloudy and Cold, Water temperature 45* and Clear. We caught bait before daylight and went fishing. I had a couple places to try this morning but there was a boat nearby one of the flats so we hit the other. I explained the "do's and don'ts, put some baits in the water and proceeded to catch Stripers. The fish seemed somewhat lethargic at times this morning but I assured the guys that when we hit a school things could change real quick. Less than 10 minutes after making that comment we hooked up to 8 Stripers, all at once. Well if the guys were cold before they surely warmed up quick trying to get as many fish in the boat as they could. I didn't touch a rod, I let them reel everything in, and they did exceptionally well, boating 7 of the 8 Stripers. We worked the area for a little while longer but the fish had moved on. We ended up limiting out by 10 am and got off the water early enough for Bobby to drive back to Md. before the Super Bowl weekend traffic got heavy. Picture is very poor quality, had to take it with my cell phone, my batteries were dead in my camera! The phone did not do the fish justice, there were 3 very nice fish out of the group of 12. I was sitting at home watching the news this morning waiting for the weather to come on. On Good Morning America they showed a picture of the US and this "Historical Storm" that was encompassing the continent. Our forecast was to only get rain and wind for this area but a lot of the states were getting pounded with bad weather. With a storm of this magnitude rolling in I wanted to slip out this afternoon and see if the fish would bite so I called a friend Tony and asked him if he wanted to go. His response was "Hell Ya'', so we left my house at 11:30 and headed for the lake. We put in at High Point, caught bait and hit a flat downlake. After pulling it for 15 minutes catching a Bass and only 1 Striper I knew we had to move so we got the baits in and ran across the lake to hit another flat that use to produce nice fish this time of the year but had been letting me down lately. We saw fish on my Lowrance and caught a few punks and a couple keepers but we both thought it was about to break loose. I boated a 8 pounder then next thing we knew boards started skipping across the surface. For the next hour we had at least 2 or 3 fish on at a time, sometimes we could not get to a fish for 3 or 4 minutes because we had our hands full baiting rods and releasing fish. We kept the first 7 keepers and released the rest till Tony caught a really nice one that he wanted to keep. We had just experienced the major feed before the storm hit us, we were ecstatic with our experience and were eager to get off the water before it started pouring. We emptied the bait tank, left biting fish and headed back to the dock. We hit the water around lunch time and were back at the dock taking pictures as the rain started to fall. We caught about 30 Stripers, most of which came in an hour time frame. A good formula for success...Happy Herring , 15 lines in the water covering a 100 yard swath and a friend who enjoys fishing as much as I do.